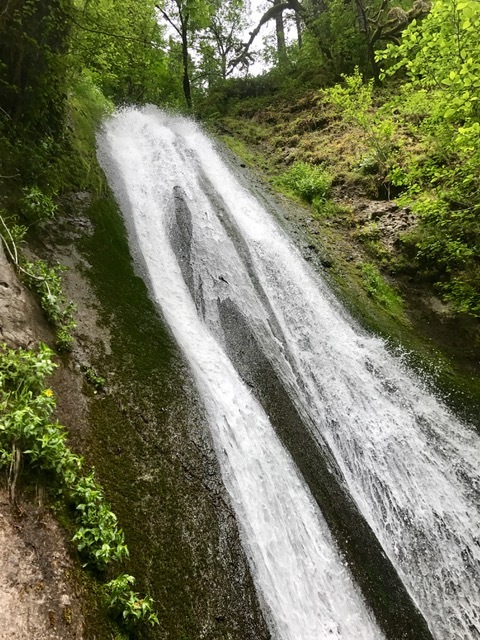 Waclella Falls — Essie Marie. A few weeks ago my family and I decided to go on a spontaneous hiking trip to the Columbia Gorge. As usual, we had no idea where we wanted to go, but knew we wanted to go somewhere we'd never hiked before. With 5 different opinions we couldn't decide on a new place. So we went to my personal favorite, Waclella Falls. Now, not only is this a great hike ; not too long, not too short, not too steep and not too easy, but there's a sweet sentiment to it. It is where my Husband and I took engagement photos. So I always feel warm and fuzzy when we make it to the falls. The huge, powerful waterfall makes for some gorgeous photos too. If you don't care for photos, it's still a stunning view to simply lay your eyes on. Once you get to the fall there's a decent-sized, frigid cold pool of fresh water waiting for you to jump in. And if you're a non swimmer, like me, you still get a nice cool down because the waterfall cast down a nice breezy mist. This is a family friendly hike with the round trip coming in a little under 2 miles.. Most of the trail is in pretty good condition, there are a few big rocks embedded into some parts, so wear sturdy shoes just as you would for any other hike. There are only two big drop offs, each at about 60 feet. So stay away from those edges and you don't have to worry about falling to your death! There are picnic tables at the beginning o the trail and great big rocks that make for a nice lunch spot. Pack up your friends or family, a lunch and a waterfall and head to Waclella Falls. If you visit this trail make sure to let me know how you like it!